Cowboys coach Jason Garrett wasn’t willing to declare Tony Romo out for Sunday’s game, despite an earlier report that the quarterback would miss the remainder of the season with a back injury. 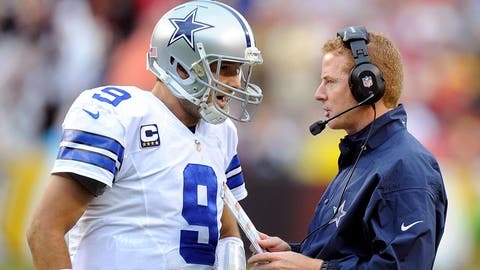 Garrett typically avoids declaring any injured player will miss a game, but he did say the Cowboys will probably sign a third quarterback and that backup Kyle Orton "will be taking snaps until Tony’s ready to go." Romo was limping noticeably after maneuvering to avoid a sack during the second half of last Sunday’s win at Washington. He was still able to lead the Cowboys to a fourth-quarter comeback in the 24-23 win. On Monday afternoon, ESPN’s Adam Schefter, citing a league source, tweeted that Romo was ruled out the rest of the season because of a back injury. Then Garrett was 30 minutes late for his scheduled press conference, sparking more speculation that ominous news was coming. However, Garrett denied that Romo has been declared out for the remainder of the season, however long that may be. "We have not made that determination at all at this point," Garrett said. "Like with any player the day after a game, you just want to see what the injury is, and we’ve done that with Tony. We want to get him involved in treatment as quickly as we can, and we’ve started that process." The Cowboys play the Eagles on Sunday night for the NFC East crown and a playoff berth. If Orton replaces Romo, it will be his first time to start a game since 2011. Orton is a 35-34 as a starter in stints with the Bears, Broncos and Chiefs. Garrett described Romo’s injury as a "hip or back type injury" and could not say whether the quarterback initially tweaked his back in practice last week. Garrett did say he doesn’t believe the injury is related to the back surgery Romo had in the off-season that was described as the removal of a cyst. The signing of a third quarterback is driven by the fact the Cowboys aren’t sure of Romo’s status for upcoming practices. However, Garrett is at least giving the appearance of holding out hope that Romo can recover in time to play Sunday. "We evaluated it last night after the game and again this morning," Garrett said. "He’s getting treatment. The MRI was part of the evaluation and there’s going to be a series of different things that we do for his treatment over the next few days and see how he responds to it."